Swim Rotorua produced an impressive display to reel in 10 medals at the NZ Division 2 Championships in Dunedin. 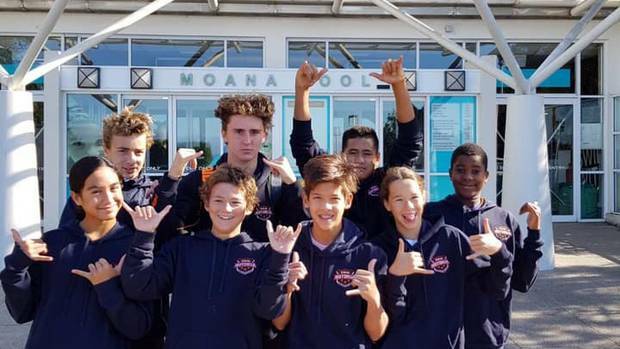 Despite taking just eight athletes with an average age of 13, the Swim Rotorua squad punched above their weight against 500 other swimmers from all over New Zealand. Taonga Wharekura stunned the packed arena with a winning time of 1m 4.76s in the boys' 12-13 years 100m backstroke. He took silver in the 50m backstroke with a swift time of 30.19s. He made finals in the 200m backstroke (5th), 50m freestyle (6th) and 50m butterfly (7th). Sam Trass lit up the pool with victory in the boys' 12-13 years 200m butterfly. He improved his best time by seven seconds in the heats, and then dropped that by a further six seconds in the final to take the gold medal in 2m 30.54s. In the 100m butterfly final it was neck and neck all the way with Sam just pipped for gold with another massive improvement to take home the silver medal in a time of 1m 8.65s. Dion Wright won three medals on his national debut with a brace of silvers and a bronze medal. These came in the 400m, 800m and 1500m freestyle with the latter event being the highlight with an excellent time of 18m 32.97s. Ngamihi Simpson had a fabulous day four, taking silver in the girls' 12-13 years 400m freestyle with a massive 13 second improvement to go 4m 44.15s. Her other medal came in the 100m butterfly in which she was involved in a titanic battle right to the last stroke. Her time of 1m 8.73s was good enough for the silver medal. Ngamihi also made finals in the 50m freestyle (4th), 200m medley (6th), 200m backstroke (8th), plus sixth place in the 400m medley. Riley Granger's medal came in the 100m breaststroke with a massive five second improvement to finish in 1m 14.90s. Riley also made several top 10 placings including the 50m breaststroke (4th), 200m breaststroke (4th), 200m medley (5th) and 400m freestyle (7th). Miki Joyce came very close to making the final in the boys' 12-13 years 50m breaststroke. His heat time of 36.94s was only a whisker away from being in the top eight. Stella Weston fought tooth and nail in all her events to post 100 per cent best times. Her top performance came in the girls' 12-13 years 1500m freestyle with a great time of 20m 16.50s to take fifth place. Aaron Muchirahondo, despite a serious hand injury in the first session, pushed on and gave 100 per cent effort. His top placing came in the boys' 12-13 years 50m backstroke. Head coach Alastair Johnson was very impressed with the young team. "Our main goal was to ensure that everyone was really competitive in every race, and to deliver on our three team words of Manaaki, determination and adaptability. "They all certainly did that and much more. I am absolutely delighted with all their achievements, which is a true reflection of all their efforts over the last few months. I have no doubt that this exciting young team will continue to grow in strength and speed."